Erwan Mahe is mad about the ECB. And the Germans. And leads us to a graph that shows that it wasn’t hyperinflation which made people vote for the NSDAP – but economic depression. 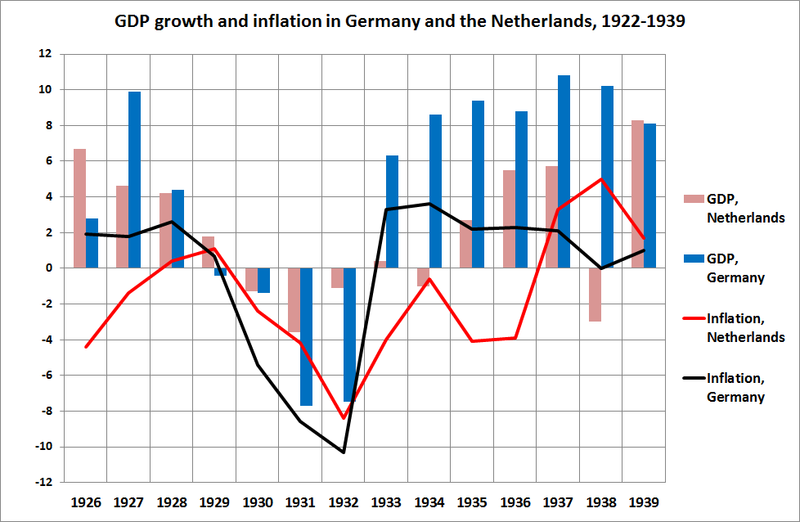 I’ve added data from the Netherlands to this graph to show that the Netherlands, which unlike Germany after 1933 did stay in the gold block, did much worse than Germany (it was actually the last country to leave gold). Which does not mean that I endorse the NSDAP or the German re-armament programs: post-war history clearly shows that aggregate expenditure can be increased by increasing purchasing power of households, too. But in an economic sense (employment, production) the reflation of the German economy did work. The present German monetary position is based on a totally skewed view of their own history. I am constantly told that Germany’s intransigence is fuelled by fears of a return of the hyperinflation of the Weimar Republic and the ensuing rise of the Nazi Party (NSP). Despite the conventional wisdom, the Nazis were not carried to power in 1933 by fears of hyperinflation which dated from 1921-1924, but by the population’s utter frustration with the extremely painful deflation drive imposed by Heinrich Aloysius Maria Elisabeth Brüning from 1930! Just consider the sequence of events: The Nazis were receiving between 2% and 3% of the vote from 1924 to 1928. Then the government sent the economy into a veritable deflationist depression in 1930-1933, as unemployment peaked to 30% in 1932. The Nazis then skyrocketed to 37.3% of the vote in the elections of July 1932, 33.1% in November of the same year and finally 43.9% in March 1933. Faced with the parallel rise of the German Communist Party (the descendants of the Spartacists) who were at the time far more revolutionary than their modern peers, President Hindenburg decided to appoint Hitler Chancellor of the Republic on 30 January 1933. This surge in extremist formations may recall some events of today. “without prejudice to the objective of price stability, the ESCB shall support the general economic policies in the Community with a view to contributing to the achievement of the objectives of the Community as laid down in Article 2.” (Treaty article 105.1). “The objectives of the Union (Article 2 of the Treaty on European Union) are a high level of employment and sustainable and non-inflationary growth”. To help Germany find its road to Damascus, I would like to suggest that the following simple graph be published in all the country’s newspaper and displayed in all school rooms. (M.K. : I changed the graph by adding the comparable Dutch data. The Dutch data show GDP, the German data show ‘Bruto Sozial Product’ which, according to the source, is however close to GDP. Source for the Dutch data: CBS). It is enough to compare the movement in these curves with the vote scores of the NSP to understand that the moralistic postures of Brüning-Laval-Mellon-Schäuble can only lead to catastrophe. The contemporary enthusiasts of the Treasury View, who dream of bringing back the gold standard with a euro totally controlled a central bank under German control, may be surprised by events in the months ahead, if they are truly honest with themselves. It is also interesting to know that Germany came with very, very strict import restrictions by late 1932, early 1933. Could this have been a major turning point for Germany? Holland, being a small country, was not able to impose any effective import restrictions, just because of the fact that international trade was a key lifeline. Many thanks for this reinforcement of the case against the hyperinflation bogey! It’s really helpful. We should spread it among german people. Just two questions: where does the German inflation data come from? And is there a time series of historical unemployment rate for Germany? Raabe, K.-H.: „Die langfristige Entwicklung des Sozialprodukts im Bundesgebiet“ in WiSta 2/1954, S. 63 ff. These are however of course measured by the Statistisches Bundesambt. (Last remark: Germany nowadays very fast with its unemployment data. Unemployment in june was according to Der Spiegel down 0,3% compared with one year ago. HEADLINE: UNEMPLOYMENT IN EAST-GERMANY IS REALLY GOING DOWN, FINALLY. Compared with one year ago: East -0,6; West -0,1. And that’s just part of the picture. Employment is also going up because lots of people on welfare, whore are nog counted as ‘unemployed’, are getting jobs, according to the Statistisches Bundesambt)). MK, the Der Spiegel data on unemployment, though, only goes to 1948. I was thinking more about a series showing the 1920s/30s. I did find a series (at Wikipedia, “Hyperinflation in Germany” entry) for the hyperinflation period, but it only covers until 1924. So, there’s one year missing, when compared to your data (not to mention that I am not sure the two series are really compatible, as they may come from different places). Being from Germany I can tell you, that “Bruttosozialprodukt” is an outdated term for “Bruttonationalprodukt”, which is German for Gross National Product. Furthermore in my own opinion, its not really the historic experiance of hyperinflation in Weimar Germany that leads Germans to being so paranoid about inflation, but the fact that if you save a lot, you are going to be much more worried about those savings being devalued through inflation than if you dont have any savings. In fact if you are highly in debted you might welcome inflation. Another factor in my opinion is, that its very easy to understand, why inflation is bad, however much harder for non-economists to get that deflation is bad and in fact even worse than inflation. The best piece of evidence of how ignorant some people are about basic economic facts is, that they want to achieve a greater level of price stability through reintroducing the gold standard since the gold standard leads to high volatility in the price level. This whole discussion shows what poor historians economists are; they talk about history all the time but don’t know much about it. Nobody with any knowledge of events that brought Hitler to power would say that it was caused by hyerinflation. Collecting graphs and charts is no substitute for knowing German politics and social psychology of fhe time.Believe it, the “Dissoluion” of the Weimar Republic and Hitler’s takeover has been thoroughly studied. It seems the economists are stuck. They can’t use historical experience as an example because they don’t know any history; they can’t use their own ahistorical eplanatory models because they don’t explain. Erwan’s use of election results is very misleading. In July 1932 the Nazi’s got 37.3% of the vote but that percentage declined to 33.1% in the November 1932 election. This was the last free election in Weimar and the Nazi percentage of the vote was falling. The 43.9% of March 1933 came after Hitler was Chancellor and had outlawed the Communist Party. With Goering as Prussian Minister of the Interior running the police. it became a managed election. Even so the Nazi’s never got a majority of the vote. So one has to look beyond election results to explain the Nazi dictator’s triumph.. Hint: look at the non-Nazi anti-Weimar groups and include the Catholic Center in your search for an explanation. Of course the explanation about deflanatory politics is correct, but the jump from that to Hitler in power is some idea of cause and effect. And then to jump to today’s politics is very little short of astonishing. As I mentioned – not clear – seeking other opinions on this. Hitler was no economists but he was an activist who put people to work on all kinds of projects. Massive unemployment disappeared in 2 years after his coming to power; there was even a labor shortage. I interviewed people who lived through the time for some work I was doing who told me that they never had a sfteady job before Hitler came to power and then they did, got married,, etc. The etc. includes WWII and the Holocaust, but also the ending of the Great Depression. Yes, unemployment was the source of dispair in the early 1930s; the hyperinflation of the early 1920s was dealt with by the Wiemar Republic. The Great Depression and massive unemployment provided too great a challenge for the fragile political system in the Republic to cope with. I think Robert is completely right about all the facts. And they are an important addendum to the blogpost. However… though these facts shoud attract our attention they should not disattract our attention from the fact, surely not unknown but still not prevalent enough in the mindset of the average economist, that crisis and high unemployment were an important asset to the Nazi’s. 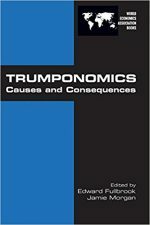 And that this was a new kind of crisis, caused by the fact that the investment rate, which in the nineteenth century was about 5%, had risen to 20, 25% – and fell to 5% again in the crisis, causing a gap in aggregate demand which could not be closed in any way by any kind of deflationary policies aimed at lowering wages (or the interest rate). It needed new demand, fuelled by new money, for new products, a kind of Schumpeterian Keynesianism. After the war, the rise of the ‘middle class’ and the cold war provided this demand (while full employment was also enabled by a dramatic decrease of the average working week). Before the war, well, you know… So, Robert is right and what he says is an important addendum. But it does not replace the post. Right. Do not wish to quibble. Without massive unemployment Hitler would never have come to power. I only wish to say that there is so much more to it than that. There was massive unemployment elsewhere without the Fascists taking over; the political culture of a country is so important. And accident and chance. As policy, the principle that ecdonomic downturn should not be countered by austerity measures seems right, whatever the political fall out (New Dealism in the US, Nationall Socialism in Germany). Despie the ultimate misuse and abuse and terrible outcomes of the power that Hitler attained apparently he had a better understanding of economic policy than a lot of economists stalking Europe today in positions of power. He did manage to turn around an economy of high unemployment in a very short period of time and no he didnt leave all policy to the central bank did he? I never meant to imply Hitler was a thinker but he was egostistical enough to build monuments in his name. Hitler stumbled across Keynesianism beforte Keynes did. it is right. How much more evidence re the failure of Europe, the UK, Ireland is required? 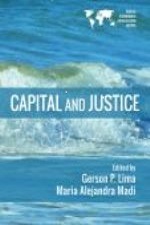 Iceland allowed its banks to fail but paid its citixens bail out money instead. Whilst still far from recovery its doing better than the austerity victim countries of Europe. The story of the housing crash recession that politicians don’t want to tell Krugman discovers theory of the firm!